Outsourcing of daily IT operations and management of company’s IT is the outsourcing program. Danush dedicates required resources such as IT System Administrator or IT Manager or combination of L1 / L2 / L3 resources to manage the IT of the client / company on a retainer model. One or more shared resources would engage with the client based on the business from time to time. The overall engagement is monitored by CxO. The general approach for outsourcing is that Danush will allocate a suitable resources required to cater to the requirements and operations of the existing IT setup. Based on the need, the supplied resources will also be assited by a shared senior consulting CTO / CIO and an Account Manager, who will be responsible for service delivery. The activities covered include business requirement in terms of IT, managing day-to-day IT issues, maintaining the network, servers, IT security, end-computing and presenting the reports to management on a period manner. The scope would also include coordination with vendors like OEMs and ISPs for resolving the issues. IT Service desk is here to connect your employees with Technology to add value to your business. 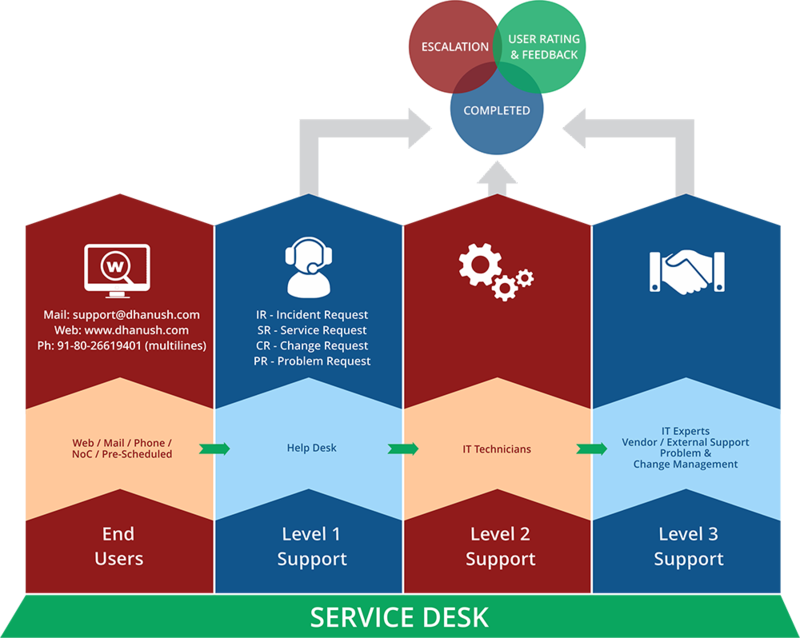 The Service Desk and Incident Management process aims to restore IT Services to defined Service Levels as quickly as possible. Reduced Overall Costs: Utilizing Danush FMS resources, increased productivity, and increased efficiency reduces the overall cost of the solution and ownership. Quality Process: Danush ITSM processes and standards will provide a managed environment and ensure delivery quality.